The use of reliquaries became an important part of Christian ritual from at least the 4th century. Relics are venerated in the Oriental Orthodox, Eastern Orthodox, Roman Catholic and some Anglican Churches. Reliquaries provide a means of protecting and displaying relics, which many believe are endowed by God with the grace ofmiraculous powers. They range in size from simple pendants or rings to coffin-like containers, to very elaborate ossuaries. Many were designed with portability in mind, often being exhibited in public or carried in procession on the saint's feast day or on other holy days. Pilgrimages often centered around the veneration of relics. 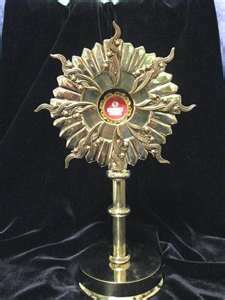 The faithful often venerate relics by bowing before the reliquary or kissing it. Those churches which observe the veneration of relics make a clear distinction between the honor given to the saints and the worship that is due to God alone (see Second Council of Nicea). 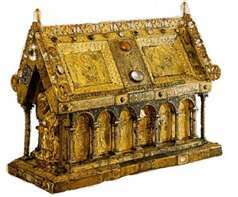 The feretrum was a medieval form of reliquary or shrine containing the sacred effigiesand relics of a saint. 16th-century reformers such as Martin Luther opposed the use of relics since many had no proof of historic authenticity. Many reliquaries, particularly in northern Europe, were destroyed by Calvinists or Calvinist sympathizers during the Reformation, being melted down or pulled apart to recover precious metals and gems. Nonetheless, the use and manufacture of reliquaries continues to this day, especially in Roman Catholic and Orthodox Christian countries. Post-Reformation reliquaries have tended to take the form of glass-sided caskets to display relics such as the bodies of saints.